Discussion in 'Databank' started by Insalius, Nov 7, 2018. This Sith holocron was constructed and recorded by Sith Master Dennys Waszylla on Ossus in 6898 BBY. The artifact contained his personal accounting on the rise of the Sith Empire, his personal views on the Force and the Dark Side, as well as giving a listing of every person that died to create the Empire and in it's service. He speaks frankly, giving the full truth as he knows it for any subject of it's contents that are asked, even speaking of the old Jedi Order and his perceived faults in their organization that led to their downfall. The whole account is an non-embellished view of the Sith Empire and the events that took place from the Battle of Ilum through the Battle of Alderaan. 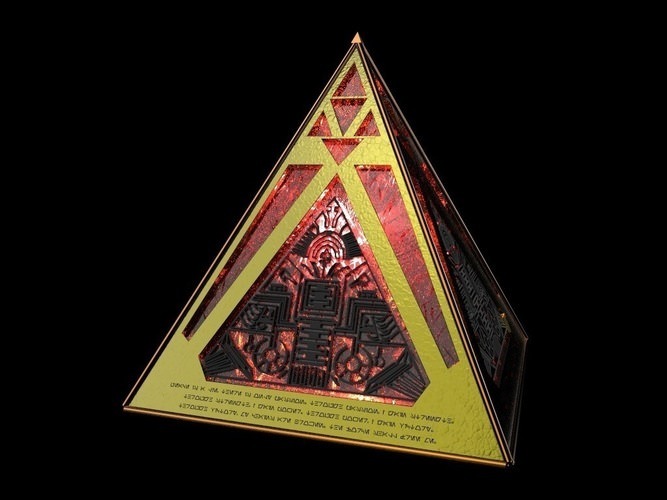 Like all Sith holocrons, the contents of the Memento Mori could only be accessed by another Sith. Dennys served as the holocron's gatekeeper, who was programed to restrict the information on the device so that the user only was able to be taught knowledge that was considered the least restricted. If a Sith wanted the most information out of the holocron they would have to force it out of the device, proving themselves as practitioners of the Dark Side by taking what they wanted. The caveat to this was that if someone of Dennys' bloodline and a Force User tried to open it, the holocron would allow them full access on the basis of them being family. This would only apply to a direct descendant of the Waszylla family. The device was meant to be used to record the unaltered history of the Exiles and how they formed the Sith Empire, from the struggles at the end of the Hundred-Year War to the Battle of Alderaan. It would gloss over nothing, listing their successes and failures, and it would also contain a list of those that had fallen during this conflict and as much information that Dennys knew about them. Deeper into the Holocron Dennys would put his views on the Force and the Dark Side, putting alongside that an account of his own life and advice to those that access that part of the archived knowledge. He would talk about things like the Old Jedi Order and how their tenets and views led to their demise, as well as the doctrines of fallen Exiles such as Rhea and Syresh Lapar and how he didn't agree with them. He left nothing out, feeling it wouldn't be right to record something like this and leave something out because he was unsure it should be included. For those of basic levels of power in the Dark Side, Dennys would appear as somewhat of a historian in describing the Sith Empire's rise and the various actions they took to get to that point. Having been involved in a good amount of operations alongside other well-known Sith Paragons, his view would offer an alternate look at them and other events that could inspire would-be Sith Lords in how to act and grow to emulate the heroes of old. It would also explain those that died and how they died, partially as a warning of what NOT to do. For more advanced users, the holocron would go into information on the Jedi Order and the philosophies of Exile Masters past, all who had fallen to the wayside thanks to the hard work of Andraste and the Empire. He would also give his views on the Force and how he used it, his unorthodox tactics combining with his own unique fighting style to give viewers insight into a close combat art that could prove surprising and disorienting to more formal combatants. Lastly, he would explain of his own possible power of the BADASS and lay out the different Waszylla Secret Techniques, treating them all seriously and explaining how and why these things worked so well for him. Finally, when someone of the Waszylla line and a Force User accessed all the information in the device, a special message to his descendant explaining why he did what he did, to live true to himself and his ideals no matter what. Once the message is done he asks them to follow their desires as he did, a compartment opening up in the holocron holding his teal lightsaber, Luceid, that he had refused to bleed once he decided to embrace the Dark Side. Dennys Waszylla was an enigma to even his closest friends, yet his simple desire to follow his heart without question would be something felt by others when they accessed the Memento Mori.